Status: Rare casual winter visitor in Panhandle. Documentation: Photograph: 12 Nov 2000 southwest Sioux Co.
12 Nov 2000-9 Mar 2001 up to six Sioux Co (Jorgensen 2002, 2003). 5 Jan and 2 Feb 2013 Scottsbluff NM, Scotts Bluff Co (Brogie 2014). 10 Feb 2001 Agate Fossil Beds SHP, Sioux Co (Jorgensen 2003). The first record was of several sightings of up to six birds with a flock of as many as 300+ Gray-crowned Rosy-Finches wintering 2000-2001 at Wind Springs Ranch, Sioux Co (Helen K. Hughson, Stephen J. Dinsmore, personal communication). A single male was found with 216 Gray-crowned Rosy-Finches 12 Nov 2000 (Jorgensen 2002); one of these was photographed 15 Jan 2001 (Brogie 2009), and on 21 Jan 2001 at least six were with this flock (Jorgensen 2003). 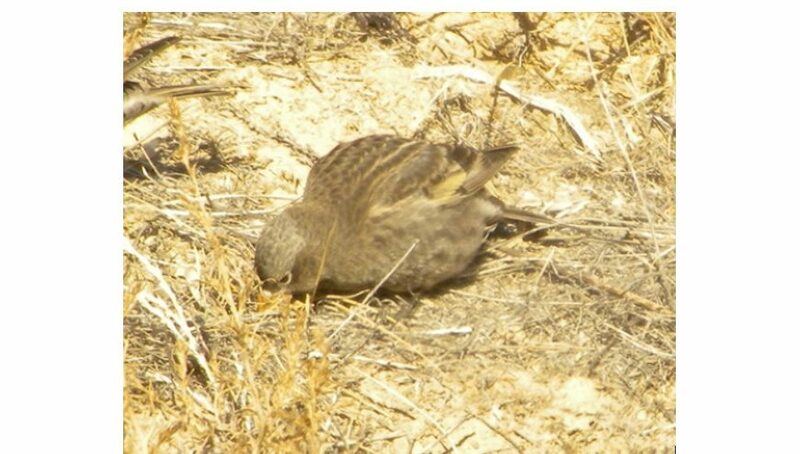 The second record was of a single found 10 Feb 2001 with a flock of about 120 Gray-crowned Rosy-Finches wintering at Agate Fossil Beds SHP (Jorgensen 2003). The third record was of up to four associating with about 90 Gray-crowned Rosy-Finches at Scottsbluff NM, Scotts Bluff Co, 5 Jan and 2 Feb 2013 (Brogie 2014). The fourth record was at the same location, where one was photographed (Brogie 2016). This species breeds on certain high-elevation mountain ranges from Idaho and west-central Montana southward through southeast Oregon, northern and eastern Nevada to southern Utah and west and north-central Wyoming, and winters within the breeding range, with a portion of the population regularly wintering up to 125 miles east and 275 miles south of the breeding range (Johnson 2002). It occurs in winter on the eastern Wyoming plains but is rare as far east as the Nebraska border (Faulkner 2010). Photograph (top) of a Black Rosy-Finch at Scottsbluff NM, Scotts Bluff Co 5 Jan 2013 by Paul Dunbar. Brogie, M.A. 2009. 2008 (20th) Report of the NOU Records Committee. NBR 77: 80-90.